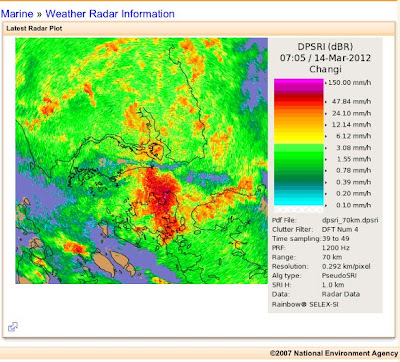 Around this time two years ago in 2010, the region faced a period of very low rainfall, and Singapore experienced one of its driest months in 140 years, where there was only 6.3 mm of rain for the whole month! Subsequently, just three months later, floods hit Orchard Road, a major shopping belt in Singapore, on 16 Jun 2010, with 100mm of rain inundating the island in just two hours! Now in 2012, the weather is uncharacteristically wet for the month of March, with heavy rains falling on a few days of every week - often with heavy thunderstorms that brought heavy rainfall all over the island. The meteorological station's radar map below on a typical rainy morning on 14 Mar shows the entire region stretching from the Indonesian islands of Batam and Bintan across to Singapore, and to large parts of southern Johor in Malaysia blanketed with heavy precipitation. 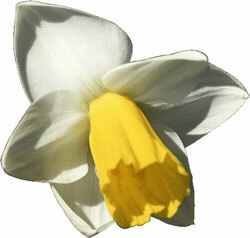 The flower of the month for March is the Daffodil (Narcissus spp.). The flower is a spring blooming bulb. The traditional Daffodil is a ring of light golden or white petals with a trumpet shaped center of a darker contrasting shade of gold/yellow. The Daffodil is used prominently for decorating during the Chinese New Year in both China and festivals celebrating this holiday around the world. 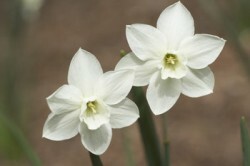 Daffodils are poisonous and can be harmful or even deadly if eaten. March is traditionally the start of the butterfly season in parts of peninsula Malaysia and Singapore, where numbers of butterflies typically increase, peaking in May or June. 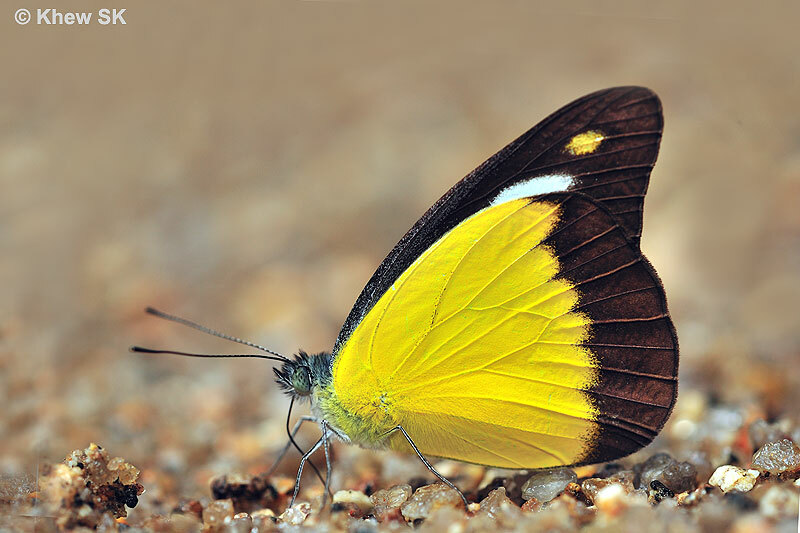 However, with the changes in weather, it is yet to be observed if the butterfly season will be delayed somewhat. 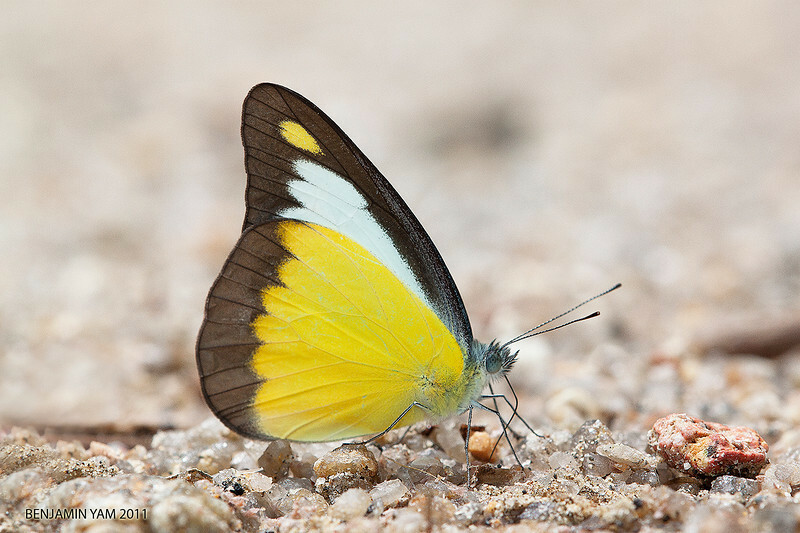 As the numbers of butterflies increase during this time of the year, some species are known to migrate in numbers across parts of Malaysia. 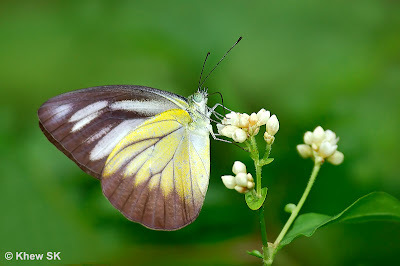 Some species of Pieridae, which are not normally resident in Singapore, fly southwards and occasionally make their appearance in the Garden City. One such species, is the Chocolate Albatross (Appias lyncida vasava) our Butterfly of the Month for March 2012. The Chocolate Albatross is common in Malaysia, and seasonally seen in abundance. 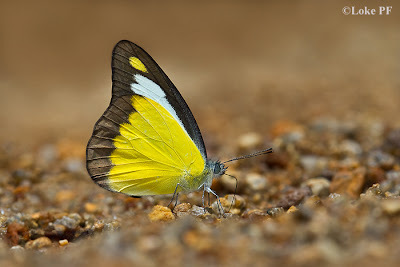 On some occasions, we have observed up to 50 or more individuals puddling at damp sandy spots along river banks in the forests. The species is not a resident species in Singapore, but records have shown that the Chocolate Albatross appears in Singapore in some years, only to be totally absent and not sighted at all in other years. 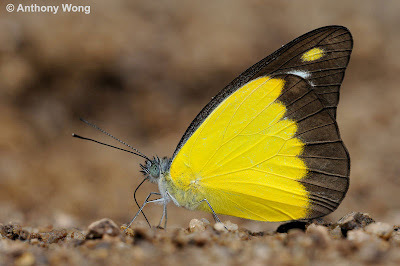 When the butterfly appears (past records indicate that it is almost always observed in the months of March to May of certain years), it can be seen as far south as the Central Catchment forests within the reservoir parks of Upper Seletar, MacRitchie and Lower Peirce. Moreover, several individuals are encountered together, either puddling or flying around flowering plants. In one instance, a female was recorded from the Sime Forest area of the Central Catchment Nature Reserve. 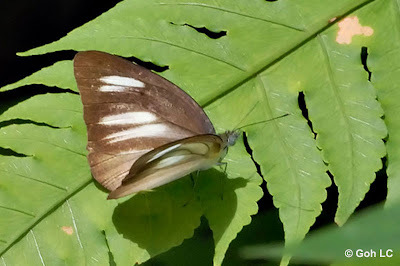 The butterfly is skittish, and a fast flyer, like its close relative, the Striped Albatross (Appias libythea olferna), a common species in Singapore. The male Chocolate Albatross is white on the upperside, with dentate black marginal borders on the fore and hind wings. The hindwing beneath is a rich lemon yellow with a dark brown border on both the fore- and hindwings. In Malaysia, large congregations of the males of this species are often encountered puddling, often in the company of other Pierids, Nymphalids and Papilionids. 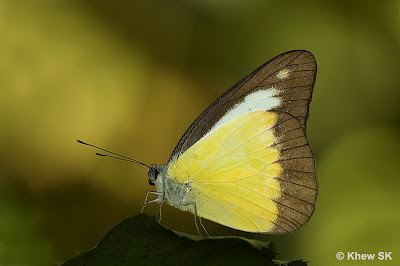 Females are much rarer, and typically found feeding at flowers along the forest edge. 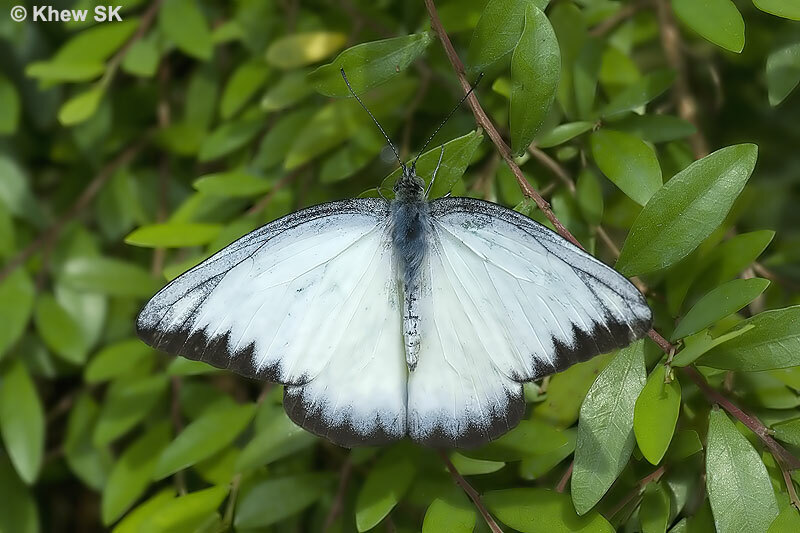 They appear almost medium grey, as the upperside is heavily black dusted with a few broad white streaks, whilst the underside is grey with the hindwing dusted with yellow, with the veins prominently marked. 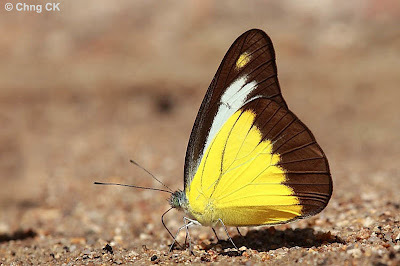 Both sexes have been observed to sunbathe with their wings partially opened on the top surfaces of leaves in the early hours of the morning, or on bright sunny days in the late afternoon. Males also sunbathe on nearby bushes especially after a long bout of puddling and have had their fill of nutrients. And as the month of March moves to a close, we end this blog article with a video clip shot by ButterflyCircle member Loke PF, of a congregation of Chocolate Albatrosses, flying in and out of the frame as they puddle and jostle for the best spots to sip their life-sustaining nutrients from the damp sandy bank. This video clip was shot at Fraser's Hill, Malaysia.